A new range of robot ‘mechanics’ under development at the University of Nottingham is set to transform jet engine maintenance at Rolls-Royce, saving the company time and money and cutting delays for air passengers. The University Technology Centre for Manufacturing and On-Wing Technologies is working with Rolls-Royce to design and build a range of bespoke prototype robots capable of performing jet engine repairs remotely. Compressor blades inside jet engines are subject to large volumes of air flow and can sometimes incur edge damage which can be dangerous if left untreated. Repairing the blade in-situ is by far the most cost-effective approach. However, in-situ inspection and repair of jet engines are inherently difficult due to restricted access to internal components. Usually, the mechanic uses bore tools to manually enter the engine via an inspection port that is typically 9mm in diameter. It is dark inside the engine, making orientation and manoeuvring of tooling very challenging. Rolls-Royce operates long-term service agreements on most of its engine contracts, meaning that the company covers the costs for the maintenance, overhaul and repair of the asset rather than the airline. Remote-controlled robotics could therefore offer significant cost and time cutting benefits to Rolls-Royce. The robots are designed to speed up inspection processes, prevent unplanned engine removal and negate the need for specialist mechanics to fly round the world to perform repairs. These developments will potentially limit disruption to flight services, saving airlines money and cutting delays for air passengers. “There is a substantial financial incentive for in-situ repair of industrial assets such as jet engines,” explains project lead from the University of Nottingham, Dragos Axinte, Professor of Manufacturing Engineering. “However, the need for highly trained mechanics to travel to the location of a repair often results in inconveniently long downtimes. The Nottingham researchers are focused on a variety of ‘snake’ robots that work their way through the engine to carry out repairs. The team is also developing miniature, collaborative ‘swarm’ robots that crawl through the inner workings of an engine. The innovative work was recently demonstrated at the 2018 Farnborough Air Show and one robot from the range has also been shortlisted for a national engineering award. REINER – is a bore-blending robot that can be remotely controlled by specialist engineers at a central operations centre. The robot, comprising a combination of rotary, prismatic and flexible joints, was designed to replicate the degree of freedom of hand-held tools to repair a compressor blade in a matter of minutes rather than days. 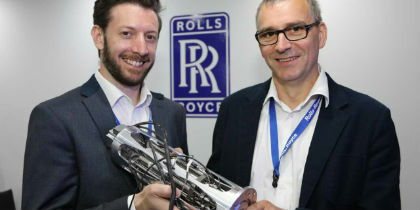 At the end of the collaborative project, which is part-funded by Innovate UK and the Aerospace Technology Institute, the prototype was demonstrated on an engine trial in a Rolls-Royce facility, a world first for this type of repair task. Since the probe is a based around an off-the-shelf dental motor, the tool it carries is interchangeable, meaning the robot could be used to perform a greater range of tasks for different business sectors in time. The robot has been shortlisted in the Defence, Security and Aerospace category of The Engineer’s Collaborate to Innovate Awards 2018. FLARE – is a pair of ‘snake’ robots which are flexible enough to travel through an engine, like an endoscope, before collaborating to carrying out patch repairs to damaged thermal barrier coatings. This project is still under lab testing. INSPECT – is a network of ‘periscope’ optical sensors permanently embedded within the engine, enabling it to inspect itself to spot and report any maintenance requirements, which they report back to the operations centre. These pencil-sized robots are thermally protected from the extreme heat generated within an engine and the visual data they create would be used alongside the millions of data points already generated by today’s engines as part of their Engine Health Monitoring systems. SWARM – miniature bots, each around 10mm in diameter which would be deposited in the centre of an engine via a ‘snake’ robot. They would then perform a visual inspection of hard to reach areas by crawling through the engine. These robots would carry small cameras that provide a live video feed back to the operator allowing them to complete a rapid visual inspection of the engine without having to remove it from the aircraft. Nottingham is currently applying for research funding with Harvard University to bring the concept to life.